Efter the collapse o the Gaddafi regime in the Libie ceevil war, Libie currently daes no hae an offeecial coat o airms. The Naitional Transitional Cooncil uises a seal or logo tae represent itsel, but while its Constitutional Declaration o August 2011 defines the Banner o Libie, it daes no mak ony proveesions for a coat o airms. The emblem o the Kinrick o Libie, kent as the "Croun o Libie", wis uised frae 1952-1969. Upper croun adorned wi a white Crescent an five-pointit starn at its summit, at which five visible side frames oreeginatin frae a ring at the base converge. The starn studdit base an frame contain a velvet black heid cover lik object. The Upper croun is supportit at its base bi twa ornate plantar designs; in the form o three intertwined C an S scroll shapes. The backgrund colour o the lairge interior belaw the upper croun can be white or transparent, awtho this is no evident in the pictur o the Libie pund. The backgrund colour o the center region surroondin the lairge white crescent an starn is black as in the center stripe o the Libie banner. A white ring wi thin black borders, surroonds the center lairge white crescent an starn. Nine five-pointit white starns surroond the center ring. Five pointit starn locatit well abuin the perimeter o the crescent. This differs frae the banner, which places the starn at the extremities o the crescent. A lawer crown, seatit abuin the ring containin the central crescent an starn. Its design is identical tae the upper croun, except for bein smawer in size. Plantar/ floral ornamentation seemilar tae #2 abuin, providin variation an connectivity tae the base. The upward-pointin white crescent an starn on black backgrund is taken frae the traditional banner o the Senussi dynasty. In 1970, Libie adoptit a coat o airms seemilar tae that o Egyp (the "Eagle o Saladin"), while in 1972 the Federation o Arab Republics unification plan led Libie tae adopt a coat o airms seemilar tae that o Sirie (the Hawk o Quraish, or emblem o the tribe o the prophet Muhammad). On Libie's exit frae the Federation in 1977 (tae acome the "Great Socialist Fowk Libie Arab Jamahiriya"), the coat o airms o the Federation wis chyngit tae reflect the new green banner o Libie an aw adoptit at that time, while the hawk wis chyngit tae face in the ither direction. The phrase اتحاد الجمهوريات العربية (ittiħād al-jumhūriyyāt al-`arabiyya "Federation (literally Union) o Arab Republics") still remained written on the banner clutched in the feet o the hawk. Wikimedia Commons haes media relatit tae Coats of arms of Libya. 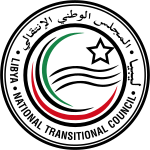 ↑ "UN approves Libya seat for NTC". Al Jazeera, Doha. Retrieved 17 September 2011.